To accompany the number of Edward Gorey books (and Gorey's Dracula: A Toy Theatre!) that we carry, D+Q now has The Strange Case of Edward Gorey by Alexander Theroux. If you find yourself curious about the man behind The Epilectic Bicycle and The Doubtful Guest, Theroux's portrait of Gorey is sure to please. Among the scanty information we learn: Gorey was a cat-lover, a balletomane (ballet enthusiast! ), and a lover of names ("Hiccupboro...The Clogstock Yacht Club...Williboo Lake...Mrs. Ümlaut...La Dame aux Pample-Mousses.") And also that he was pretty much obsessed with Oreo cookies. I share with you the nominal facts because I don't want to spoil the actual goods of the this book. 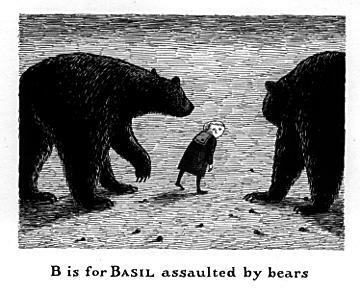 A charming Gorey illustration. Just for kicks.